Members, please login. Not a member? Create a login & Join us! Membership is free & gives you access to book giveaways, author chats & your private, free book club page. eBook includes special materials for book clubs: a Q&A with Celeste Ng and John Green, a letter from Celeste Ng, and book club discussion questions. A New York Times Top Ten Book of the Year and National Book Award finalist, Pachinko is an "extraordinary epic" of four generations of a poor Korean immigrant family as they fight to control their destiny in 20th-century Japan (San Francisco Chronicle). Join the leading website for book clubs with over 35,000 clubs and 20,000 reading guides. 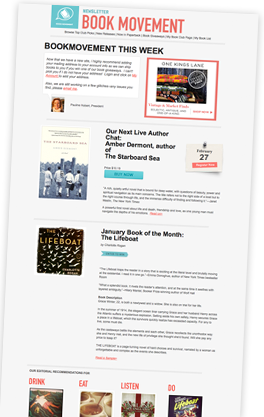 Sign up for your FREE email about the latest top book club picks, exclusive book giveaways, new releases, and online author events. © 2003 - 2017 BookMovement, LLC. All rights reserved.